Now that Christmas has come and gone, the Roberts' family finally has time to update this blog. Rather than share the entire Christmas story in one post I have decided to break it down to relive the holiday season in captured moments. It officially started two days before Christmas when Ashley and I hauled the kids down to East Wenatchee to meet the man himself.... Santa Claus. Hayden was mesmerized the entire time... for Payton though it was a little different experience. 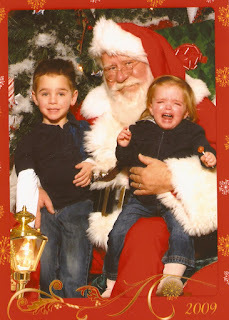 Some might say she was a "little scared"... others might say she was "petrified"... still others might call it "child abuse".... whatever the terminology you use, I recognize it as the official starting point of the Roberts' family holiday season.